If you are new to Divine Will, or want to link with all seven qualities of Divine Will, this course will assist you. In this course you will receive 7 qualities of Divine Will (also called Higher Will) from the Great Ones who transmit Divine Will to humanity. Divine Will is one of the most transformative energies in the universe. Divine Will transforms every level of your being when you open to its energy. Receiving and aligning with the 7 qualities of Divine Will taught in Orin's course can transform your life, unfold your highest potential, expand your consciousness, and assist you in manifesting in alignment with the Divine Plan and the higher purpose of your life. Divine Will is pure spiritual energy that comes from the higher dimensions. Calling it to you creates an enormous infusion of spiritual energy into your life that awakens new consciousness, realizations, and revelations. As you align with Divine Will, you infuse your personality with new skills and more power to carry out your higher goals and purposes. Working in this way can create wonderful changes in your earth plane life. 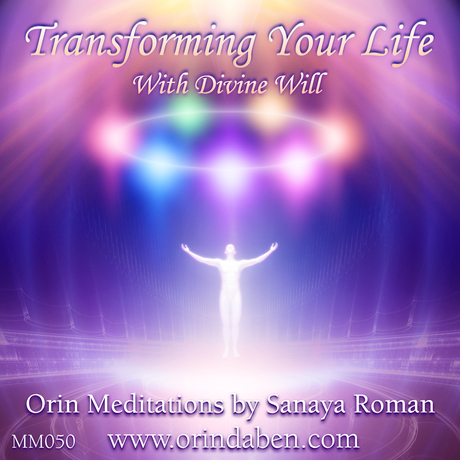 To transform your life and consciousness with Divine Will, you need to contact It, call It to you, and draw It into your life as Orin will guide you to do in the journeys in this course. You will learn how to call upon each of the 7 Great Ones transmitting Divine Will. Linking with Divine Will can deepen your connection to your soul and Divine Self. As you work with and open to receive the energies being transmitted in this course from Divine Will, Orin, your soul, and the beings of light, you can awaken spiritual vision, deepen your intuition and wisdom; experience an illumined mind, let go of struggles, and release lesser energies and limitations. You will ask for and receive energy from them to increase your spiritual power, love, creative intelligence, purpose, clarity, harmony, understanding, wisdom, intuition, clear thinking, illumination, and inspiration. You can link with Divine Will to experience more spiritual power, to initiate new awareness, to let go of battles, to follow the highest light within you, and to create heaven on earth. Aligning with Divine Will can be one of the most transformative steps you can take on your path of Self realization and enlightenment. Understanding and working with Divine Will is a part of taking higher initiations, and is a way to open a doorway into higher realizations of Oneness and God-Consciousness. During our time together we will come together to invite Divine Will into our lives. We be working with Live Guided Meditations plus some of Orin's recorded meditations. There will be time to discuss and share our thoughts and experiences as Divine Will transforms our lives in the most thrilling ways over the coming months. Program 1: Preparing for Divine Will –– Receive transmissions from a very high being to prepare you for direct contact with the 7 Great Ones who transmit Divine Will. Program 2: Contacting Divine Will –– Contact each of the Great Ones who transmit Divine Will to harmonize with their patterns of light, color, sound, tones, and subtle energies. Program 3: The Will to Initiate –– Awakening New Consciousness Blend with this Great One who initiates expansions of consciousness, so you can receive insights and revelations, and initiate activities that are in alignment with the divine plan of your life. Program 4: The Will to Unify –– Developing Vision Merge with this Great One who brings you the gift of clear vision through knowing what is to be loved. Bring unity to your personality, soul, and spirit. Increase your ability to see your soul, the souls of others, and the beings of light who guide humanity. Program 5: The Will to Evolve –– Becoming Wise Blend with this Great One and strengthen your ability to evolve both your consciousness and all the forms and circumstances in your life. Increase your ability to express the creative intelligence of your soul to create your highest future. Program 6: The Will to Harmonize –– Deepening Intuition This Great One transmits the illumined will that releases limitations. Working with this Being can help you bring harmony to areas of conflict and expand your ability to create art, music, and beauty in all forms. It is the basis of the intuition. Program 7: The Will to Act –– Achieving Liberation Join with this Great One and with the Solar Angel of the mind to align your higher mind with your everyday, concrete mind. Your mind can then fulfill its purpose of being a channel for the inflow of higher mind energy and your personality can become a pure channel for Divine Will, leading to liberation. Program 8: The Will to Cause –– Embodying High Ideals The transmissions from this Great One cause the mind of God to be known, which appear in your mind as ideals that you live by. Live by the ideals of your soul, which bring you love, freedom, and enlightenment. This Will brings the ability to release personality desire, endurance, and detachment. Program 9: The Will to Express –– Creating Divinity in Form This Being makes the work of the other Great Ones appear on the physical plane in a rhythmic, orderly way. It works with the devas and forces that manifest forms. Draw in its qualities of strength, perseverance, courage, self-reliance, steadfastness, care in details, and precision in creating form. Program 10: Manifesting with Divine Will –– Work with all 7 qualities of Divine Will to manifest something important in your life. Program 11: Creating Ideal Relationships –– Draw in the 7 qualities of Divine Will to transform a special relationship, or all your relationships at once as you align them with Divine Will. Program 12: Transmitting Divine Will –– Absorb and then transmit the qualities of Divine Will to your life, to your loved ones, to the animal, plant, and mineral kingdoms, and to whatever you choose. $150 due @ First Class June 3rd. Because this is a first time offering, the class is discounted at 1/2 price only $33 a class!! !